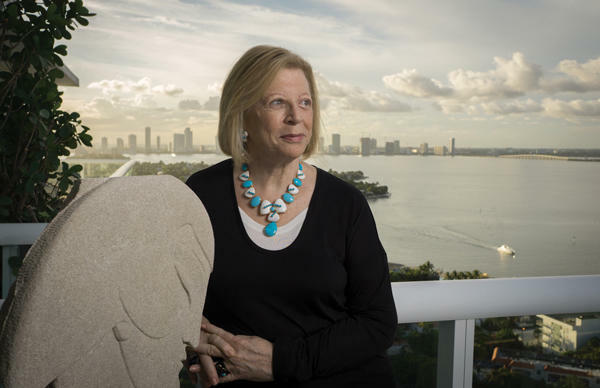 Sitting on a couch in a model residence at the Four Seasons Hotel and Residences at the Surf Club in Surfside, Louise Sunshine interrupts a sales pitch about its sister project in Fort Lauderdale. “Never use a rendering of a ballroom again,” she said, bluntly but not critically, to Dan Teixeira, a Douglas Elliman director of sales, regarding a slide in his presentation. Potential buyers don’t want to be reminded of event spaces like ballrooms and the guests that come with them, she explained. Sunshine, 78, isn’t slowing down. The sales, marketing and development expert, who famously served as an executive vice president at the Trump Organization from 1973 to 1985, has had several professional lives since her time with the president — of whom she still speaks fondly. In 1986, she founded the Sunshine Group, ultimately selling it in 2002 to New Jersey-based NRT, which later merged it with the Corcoran Group. Today, Sunshine’s a strategic adviser for Miami-based real estate investor Fort Partners, working on Four Seasons-branded developments in South Florida. She travels between sites, working primarily on the Surfside and Fort Lauderdale projects. The Surfside development, where unit owners include New York developer Richard LeFrak, billionaire real estate and casino tycoon Neil Bluhm and Miami Heat President Pat Riley, was completed about two years ago. Sunshine said it has 26 residences left to be sold. 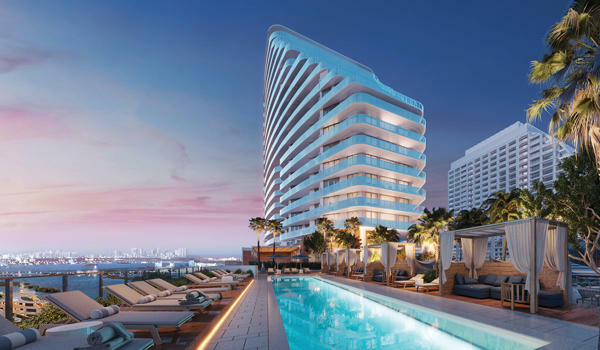 The Fort Lauderdale project, which is 53 percent sold, was designed by Miami architect Kobi Karp. It is currently under construction. Preaching the gospel of the Four Seasons brand, Sunshine said buyers at the Four Seasons Private Residences Fort Lauderdale are “without hesitation” paying more than $2,000 per foot — prices that are on par with the luxury condo market in Miami. “This is an amazing thing, because the highest price in Fort Lauderdale has been at the Auberge [Beach Residences Fort Lauderdale] — probably $1,100 a foot,” added Sunshine in her perpetual pitch mode. Sunshine sat down with The Real Deal to discuss her day job, her five-year plan and why she prefers dating in New York rather than in Miami. What is your role as strategic adviser for Fort Partners? Chief, cook and bottle washer. I’m at [Fort Partners principal] Nadim Ashi’s beck and call. I strategize and implement all things having to do with the residential, development marketing and sales, and I oversee it. I give them my best thoughts and my experience. I’ve been in this business 45 years and I still keep all my connections going in New York, California and abroad, and I’m able to use them for the benefit of these developments. I’m able to offer them a unique perspective on the marketplace because I’m very current. I’m very involved in many things. It’s not like I disappeared. I’m very relevant. I’m very involved. I’m very up on things, and I’m able to contribute significantly on what they are thinking, how they are thinking and to whom they are marketing. Where are the buyers coming from at the Surf Club? They’re mainly from the Northeast, Chicago and Boston. If you go to Fendi [Chateau Residences in Surfside] or you go to the St. Regis [Bal Harbour Resort] or you go to Faena [House], you need to speak Russian, Spanish, Arabic to even understand what’s going on there. Here, you really need to speak English. It’s very unique for South Florida. You purchased a unit at the Four Seasons Residences at the Surf Club and also have had your unit at the Grand Venetian listed for sale. Are you planning on moving to Surfside? I am waiting to sell my unit [at the Grand Venetian first]. It’s listed by the Jills. My dogs don’t want to move. They’re Cavachons, Benny and Patch. The most adorable. But they’re happy where they are. Are you personally recruiting buyers? Always. And are they your friends? Mostly. I can’t speak highly enough about this development [Surfside]. I really believe in it. I’m not really selling it if I bought here. Developers are known to be “whatever.” But he [Nadim Ashi] is not a “whatever.’”He is a solid, stable, trustworthy individual who delivers and goes beyond delivery. The perfection that people are getting in their residences, I don’t believe it. What is Fort Partners planning on the property just north of the Surf Club site? That’s going to be partially large residences, partially hotel residences managed by the Four Seasons, but it will be designed inside and out by Joseph Dirand. It’s fully designed, maybe it would go into sales by next spring. What’s your main source of insider intel on the market? I’m in New York a lot. I’m involved with the brokerage community, with developers, so that’s my main source of information. Where do you see yourself in five years? I plan to keep working, so if I will be living, I will be working. And if I will be working, I will be creating something. I’m already thinking about a couple of ideas, which I can’t discuss, but one of them will revolutionize the way real estate is sold today. I’m hoping to be able to implement that business plan. You devote a lot of your time to mentoring other women. Why? When I owned the Sunshine Group, I built it with women. I built my whole company with women. I always felt, since Donald Trump gave me a chance to become who I became, I always wanted to give that opportunity to other women because I was so grateful for somebody understanding that I had talent, intelligence and ability and could develop it. What did you learn from working for Donald Trump? I really think the most important lesson I learned from him was to allow people to grow and express their talents and give them enough [room] to do that. And provide the environment for them to nurture them. That’s a big thing, because people don’t like to let go. People are afraid. They’re always protecting their turf. But Donald gave me the space, and respected me enough to do my thing and taught me along the way. I always say he was the greatest teacher I ever had and I was probably the greatest student he ever had. How do you unwind? Number one, I play with my dogs. They are a source of unconditional love. Number two, I spend a lot of time talking and being with my grandchildren. My granddaughter is graduating from college this year. We’re great friends. She’s very interested in urban planning and urban design, so we have a commonality of interests. What else? I love to travel. In fact, I have a search out for traveling companions because my husband [longtime New York civic leader Martin Begun] died three years ago, and I really don’t like to travel alone. I’m just looking for people. I want to go to the Far East. I just have these ideas of places I want to go, and I would love to have somebody fun I can go with. I have a lot of interests. I collect art, I love music. I love people, and I don’t like small talk. You’ve mentioned that you’ve been doing some online dating. Do tell! I joined a group called “It’s Just Lunch.” I went on seven different internet dating sites. That’s what I do in my spare time. My experience was such that I want to do a reality TV show on senior internet dating, and I’m working on it. I’m keeping all of these files and information on all of these dates and the people I talk to. It’s like a research project. One day I left my house at 9 o’clock in the morning with a driver and my two dogs, and I met nine men. I started out on the Venetian and I met somebody in Miami Beach. I met somebody in Aventura, Fort Lauderdale [and] Jupiter. I ended up at dinner in Palm Beach and I got home at like 11 o’clock at night. The bottom line is I wasn’t interested in any of these men, really, but I was interested in the process. I was interested to find out how it works when you’re a senior on all of these dating sites and what kind of people you meet. And then I did the same experiment in New York, and New York won. There’s no comparison between Florida and New York in terms of who you meet. The people are much more interesting, much more alert, diverse. They’re just… much more alive. So you’re planning a senior dating reality show? I met a woman named Meredith; now we’re looking for a producer. I mean, no one has ever done it. People are living longer, until they’re 104, 106. And they’re looking better. And they’re looking younger and they’re more vibrant. They’re widowers, they’re divorcees. It’s an incredible part of our culture that no one is really focused on. So that’s what I do in my spare time. It’s really fun, by the way. I can be in a meeting like [I was] this afternoon and pull up Match.com. We worked on Harvey this afternoon. Charlotte Maietto, who handles marketing and communications for Fort Partners, chimed in. Charlotte: His name was Marvin. Louise: Marvin, right. Marvin worked in Boca [Raton]. My objective is every day I want to learn something new. What did you learn today? This is kind of simplistic, but what I learned today was how to pay my bills [and] how to do my own bookkeeping. I’ve always had a huge staff. I had a driver, I had an accountant. Gradually, I have nobody, and so gradually, I’m learning to do everything myself. So today I mastered the art of paying my own bills, setting it up on Chase Pay, learning how to enter it onto American Express, read my statements and pay my bills. That’s a huge thing. My generation, we use checks. Did you ever hear of checks? Yes. What’s on your desk? On my desk are photos. I really enjoy looking at pictures of myself with Donald Trump, with Jimmy Carter, with the Clintons. This was a whole part of my life. A very important part of my life were the roles I played in the world of government, politics, Trump World. And then there are these photographs of my family, which have been so major to me. I have three children — not children, 55, 55, and 52 — and three grandchildren — 9, 19 and 22 — and their pictures and then my dogs. I have hundreds of pictures in my house because my life has been so interesting. I just love looking at them, even if it’s me and Donald’s first wife, Ivana. Just looking at the TV today and seeing Donald all day long even though I don’t like what he’s doing. It’s like, oh my God, this is my life.